Following on from last week’s post about Asia Bookroom, the bookshop in Australia devoted to books with Asian interest, here’s a guest post from Mariam Mathew, organizer of a book club in London devoted to discussing books by Asian authors, and books about Asia. In a city like London, it is possible to walk by hundreds of people in a day, but not really connect with a single person. Perhaps more than most places, it is here that one craves the opportunity for building a sense of community. There are many ways to find community, but one of the most powerful methods of the past decade in major cities around the world has been through meetup.com. I found and happily joined one such group, Asian Authors/Books about Asia Meetup during a difficult period of my life several years ago when I experienced a serious relationship breakup and realized that I had not built up a network of friends outside of my professional work. Asian Authors/Books From Asia Meetup was launched in 2008, by Vineet Vijh. One of the best decisions of this group was to allow people in the membership to create their own events. The group has participated in events such as author talks, gallery visits, and movie and theatre evenings. In fact, Vineet hosted the group at his own home for some special events, such as Diwali or Christmas celebrations, or our group’s anniversary in October. Members have even participated in literary festivals such as the long-established Hay-on-Wye, in Wales, and the new-kid-on-the block, Jaipur Literary Festival. After five years, Vineet decided to hand over the baton of Organizer to an Englishman named Peter Latham, last year while I recently had the honour of taking over the role, having to fill some rather large shoes after being a member for the past six years. During the last seven years, the group has collectively read over 100 books, and hosted 300 meetup events. Books and the location for the meeting are generally chosen by the host of the book discussion for the month, which is passed along by volunteers from the group membership. Sometimes, these choices are tied to an event, such as the decision to read The Architect’s Apprentice by Elif Shafak, as we were planning to attend a lecture conducted by the Turkish author. Last year, under the guidance of Peter, the group decided to allow non-fiction options as well, but fiction still reigns in most of the choices. While we tend towards books originally written in English, we do discuss translations and once veered off our regular course enough to choose two Manga comic books, Vampire Knight and Emma. Most of our members read physical books, though a few of us opt for eBooks on our Kindles or tablets. Regardless of form, the genre is generally tied to the idea of reading books about Asia and/or by Asian authors (Asian diaspora included). After a broad survey a couple of years ago, our members indicated that this is a special feature in a city crawling with literary groups hosting book discussions. Book discussions take place at restaurants, cafes or hotel bars around London. A meeting typically starts with each participant rating the book out of 5 (decimal values allowed) and then the host poses various questions, often on small, finely folded pieces of paper to pass out. Our most recent discussion was about a book set mainly in China and Japan and the host actually used origami paper for this! At the end of the discussion, each member gives a new rating to see if their opinion has changed after the lively and controversial conversations. We even do some quick mental math to get an average rating for the book. We recently crossed 900-strong membership and we are still steadily growing. 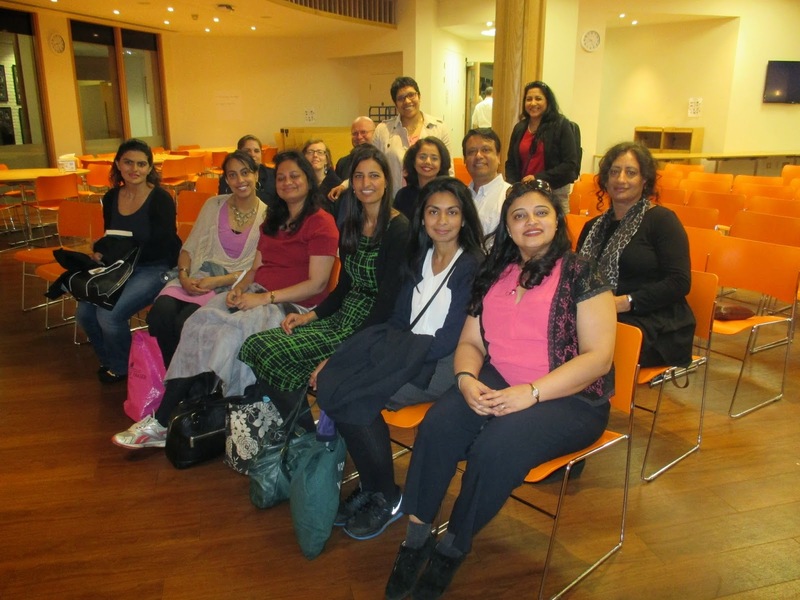 While our membership is predominantly women and those of South Asian descent, we nevertheless represent the diversity that is the city of London. With people from all parts of the world, from Europe to North and South America, Africa, Asia and Australia, we get wonderfully diverse viewpoints and experiences at the book discussions. In fact, whenever we discuss a book with a cultural context different than that of the majority of the group, it is amazing to see the stories and connections which are drawn out like spider silk from the members participating in the discussion. Whether the books are set in Trinidad or Turkey, Cambodia or Iran, China, Japan, India or Sri Lanka, we have seen this time and again. It is no wonder that we leave with a sense of wonder about the complexity and majesty of our world and yet recognize that this round orb on which we reside is actually quite a connected little neighbourhood. While people join for a variety of reasons, most join through meetup.com and then stay and participate for sometimes a different set of reasons. Some members have made life-long friends and get together beyond the formal events of the book group, keep connected through Facebook and other social media, and support each other through special challenges, events and milestones. Others come once in a while, but when they do they receive a warm welcome. For all, it is an opportunity to learn more about the world around us and be challenged in our thinking. Rare is the time when someone hasn’t changed their rating for a book after the lively discussion! This year, we have some special events planned including a literary chocolate tour of London and a barbecue event at a member’s home, as well as our annual visit to Hay-on-Wye, regular book discussions, and various cultural outings. My hope, as ever, for the group, is that we will be able to continue to have a vibrant and supportive group that may provide a bit of salve for those who reach for connection among a group of people who love books or all things Asia or just want to connect with those who do.